Meet Mamello. She joined us in the safe-house two days ago. There's something about that smile that really gets to me. Beautiful, isn't it? Yesterday, Mamello and I spent a good part of the day looking at all the old pictures on my camera. Once she figured out how to scroll through the photos, she couldn't get enough. Every time she'd come across an old picture of my cat she look up at me with a smile and a giggle. It is such a privilege to be able to share such a simple moment of joy with a child like Mamello. In this small interaction, she showed so much strength and determination to win the battles she is fighting. Mamello spent the past few weeks in the hospital due to severe malnutrition. She's HIV positive and comes from a child-run household...meaning her parents died of HIV and a young aunt is now tasked with raising Mamello and her siblings. Because of her malnutrition and untreated HIV, Mamello is extremely weak and spends most of the day lying on her side watching the other little ones play. But each day, I'll try to find something new to bring out that beautiful smile. And before we all know it, Mamello will be the one we're all marveling at as she dances around the room. 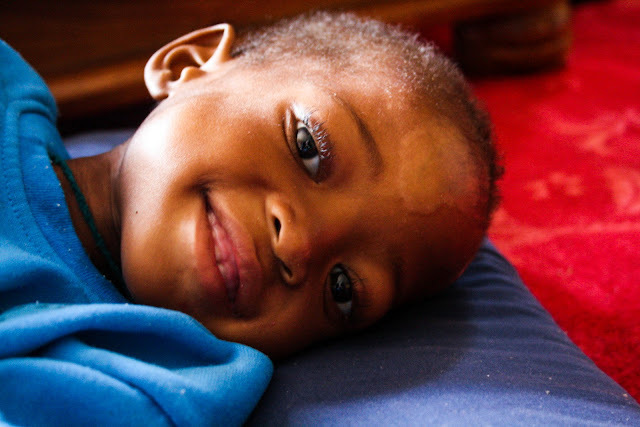 Since I initially wrote this post, Mamello has returned to the hospital to undergo another round of treatment for malnutrition and to begin an ARV regiment. All her little friends and all the staff at TTL eagerly await her return to the safe-house.